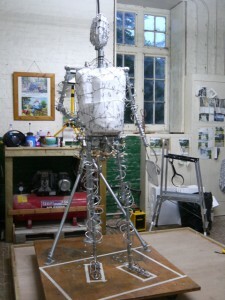 Now it’s up to me to finish off the armature. The main structure is complete. But I want to double-check all the measurements before I add anything more. I make some minor adjustments to the angle of the hips and shoulders, referring back to the maquette. I have a very long armature ‘to do’ list. I need to make specific armatures for Sir Nigel’s head, feet, left hand, the magazine he will be holding. I need to add more smaller-gauge wire in twists across the polystyrene torso. I also need to wrap lengths and lengths of aluminium armature wire around his legs and arms so the clay has something to grip onto. Each day I tackle one main armature task. It never fails to surprise me how long this process takes. 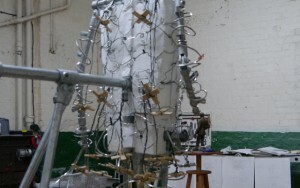 And it is likely that I will re-work sections of the armature. This is the case with the armature for the head. After a few days I decide that the head needs to be further forward. 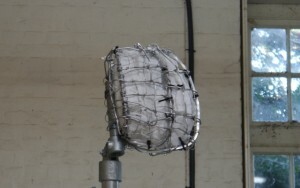 This means I need to re-work the aluminium wire cage I had made so painstakingly. As I come towards the end of my ‘to do’ list it is time to make butterflies. These are crosses of wood that will hang off the steel frame that will support the large volume of clay making up Sir Nigel’s jacket. This is quite a traditional technique. So out comes the saw and the drill. All done. I look at my hands and arms – broken nails, cuts, bruises. This is not a glamorous life. But a very contented one.